Chayote squash is a vegetable which is not so popular but has been used in our house since childhood. I like the texture and green color of chayote. By the way it is also known by various names like seema vankaya , chow chow and bangalore vankaya. Until now I was not aware of the fact that it is very rich in fiber, potassium and vitamin C. Apparently the leaves from this plant have medicinal uses as well. It is supposed to dissolve kidney stones and also reduce hypertension. Since my family is a fan of potato I wanted to try the combination of these vegetables and so this curry has occupied a prime spot in our dinner menu. 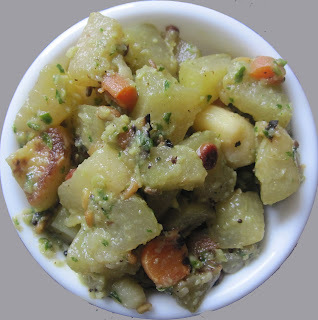 After the mustard seeds start crackling, add chopped chayote, potato, carrot and turmeric and saute them for a minute. Add the paste of Ginger, Coconut, green chillies, jeera and coriander leaves. Pour some milk and let it simmer. Add salt and mix for a couple of minutes. Switch off the flame and serve hot with Roti or Rice.